Background Clinical pharmacy services have been associated with decreased mortality rates, length of stay, medication errors, adverse drug reactions and total cost of care. Such services have recently been introduced to the Western Pacific Region (WPR), particularly in Asia. A survey to measure clinical pharmacy services that influence prescribing has been validated in the WPR and can be used to explore the implementation of such services. Objective To explore the implementation of clinical pharmacy services that influence prescribing in the WPR and the barriers and facilitators involved in their implementation. Setting Hospital pharmacies in the WPR. Method Hospital pharmacy directors in the WPR were emailed a link to the validated survey. Surveys were available in English, Japanese, Chinese, Vietnamese, Lao, Khmer, French and Mongolian. Main outcome measure (1) Percentage of hospitals offering clinical pharmacy services. (2) Percentage of in-patients receiving a medication history, review or discharge counselling by a pharmacist. Results In total, 726 responses were received from 31 countries and nations. Nearly all hospitals, 90.6 % (658/726), stated they provided clinical pharmacy services. On average 28 % of their clinical pharmacists attended medical rounds regularly. 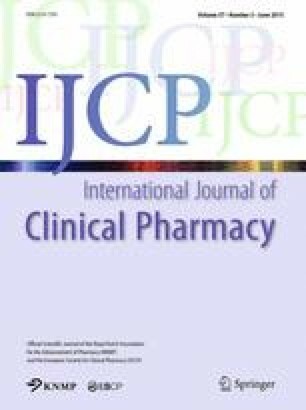 The median percentage of inpatients receiving a medication history and discharge counselling by a pharmacist was 40 and 30 % respectively. Higher internal facilitator factor scores significantly increased the likelihood of offering clinical services and having pharmacists attend medical rounds regularly. Internal facilitators included individual pharmacist traits and pharmacy departmental structure/resources. Higher environmental facilitator factor scores and having a higher percentage of pharmacists attend medical rounds regularly significantly increased the likelihood of inpatients receiving a medication history, a medication review and discharge counselling by a pharmacist. Environment facilitators included government support, patient and physician expectations. Conclusion A large proportion of hospitals in the WPR have implemented clinical pharmacy services. Although internal facilitators were shown to be important for initiating such services, the addition of environmental facilitators and ward round participation by pharmacists allowed clinical services to be integrated throughout the hospitals. We would like to acknowledge the help of the following groups for aiding us distribute the survey: Chinese Pharmaceutical Association, Food and Drug Department, Ministry of Health, Lao People’s Democratic Republic, Hong Kong Hospital Authority, Japanese Society of Hospital Pharmacists, Korean Society of Health-System Pharmacists, New Zealand Hospital Pharmacists’ Association, Pharmaceutical Services Division, Ministry of Health Malaysia, Pharmaceutical Society of Papua New Guinea, Philippine Society of Hospital Pharmacists, Society of Hospital Pharmacists of Australia, Taiwan Society of Health-System Pharmacists. All those that participated in the study. This work was supported by a grant from the International Pharmaceutical Federation Hospital Pharmacy Section.